Every summer I have crazy amounts of mint growing wild in my garden and I think, “oooh, I should make fresh mint ice cream” and so I do, and then I take a bite and remember that fresh mint ice cream kind of tastes like regular mint ice cream that someone added weeds to. Done right, fresh mint ice cream can be pretty stellar, but I’ve found it’s a little tricky and the flavor most people really like is with good ol’ peppermint extract. So THIS summer, I did it right. I’ve also tackled a pet peeve of mine with chocolate chunks in ice cream, and that’s when it gets frozen and turns hard and waxy and doesn’t even taste like chocolate. (Like, don’t even try to put M&M’s in my Blizzard.) 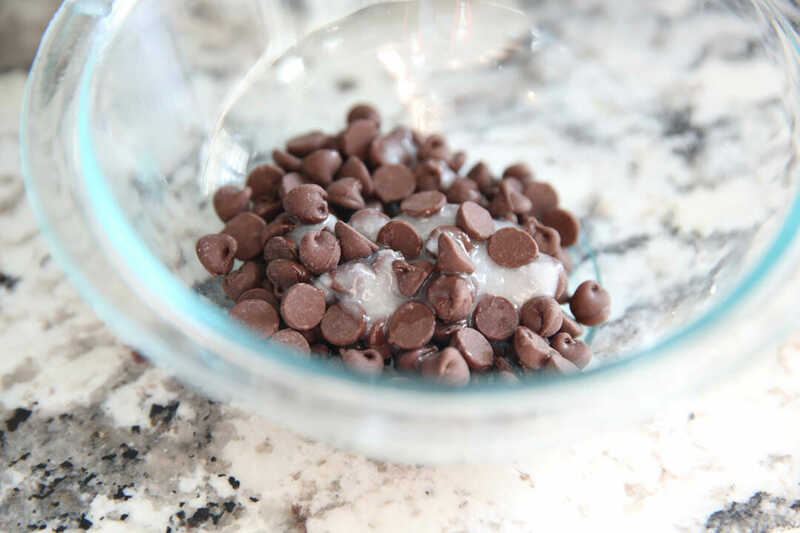 Instead of tossing in chocolate chips, I melt chocolate with coconut oil, so it still freezes like ribbons and bits of chocolate with a little crispy bite, but it quickly melts in your mouth to a smooth, soft, velvety chocolate bite. To make this ice cream, we’ll start with my perfect Vanilla Ice Cream Base. It’s egg free and has just 4 ingredients, so easy-peasy! Cream, whole milk, sugar, and vanilla. And to that, we’re going to add a whole tablespoon of Peppermint Extract. I love peppermint. We’re talking LOVE peppermint, so if you’re a little more iffy, you could do 2 teaspoons, but I like to really be able to taste it. 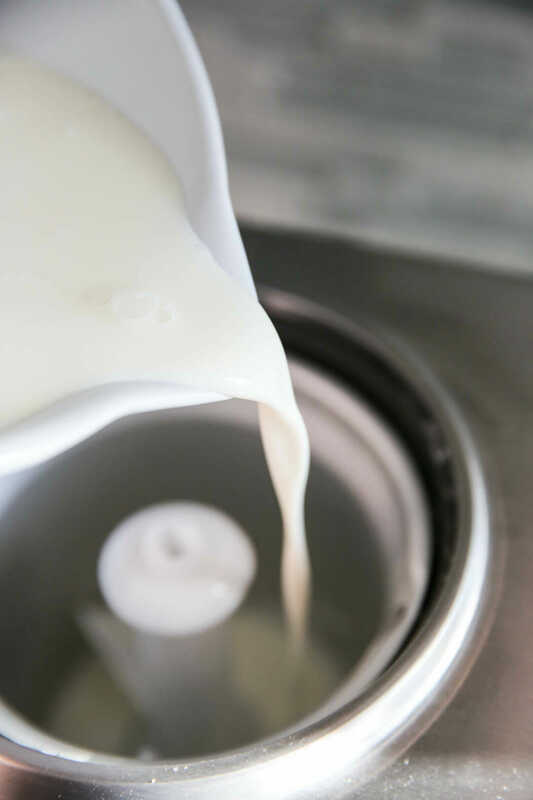 If you want info on ice cream makers, and our suggestions, read this post! 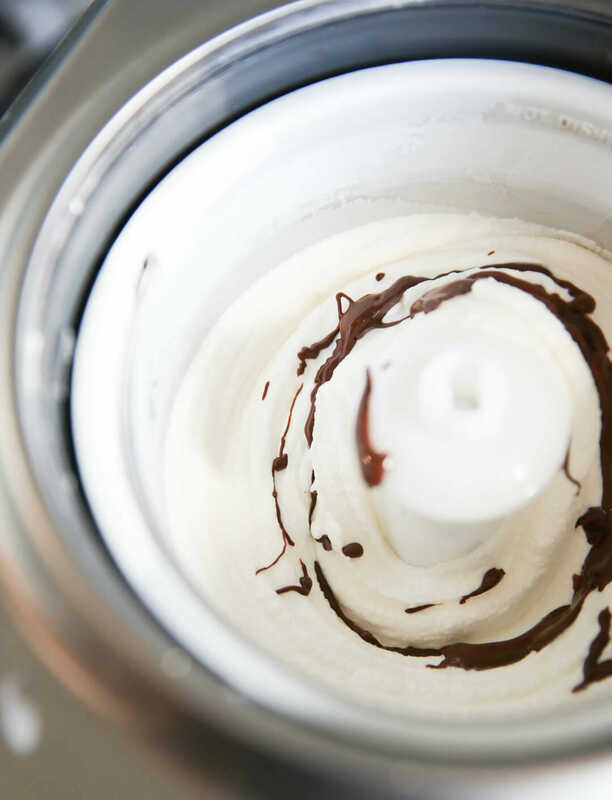 While this is processing in your ice cream maker, you’ll prep your chocolate. As I mentioned, we’re melting chocolate (you can use chocolate chips, chocolate bars, dark, semi-sweet, whatever you like!) with a little coconut oil. I’m using refined coconut oil so that it doesn’t have a coconut flavor. Unrefined oil tastes like coconut, but refined is neutral. If you have a strongly coconut-flavored oil, I actually don’t think it would be bad in here. The flavor should remain mild enough to be overpowered by the mint and chocolate so I’d say you’re probably good. I also like to add just a bit of mint extract to my chocolate as well, so as it melts in your mouth you get a mild burst of mint! You can drizzle it in during the final stages of churning, like shown here, but that’s actually not what I do. 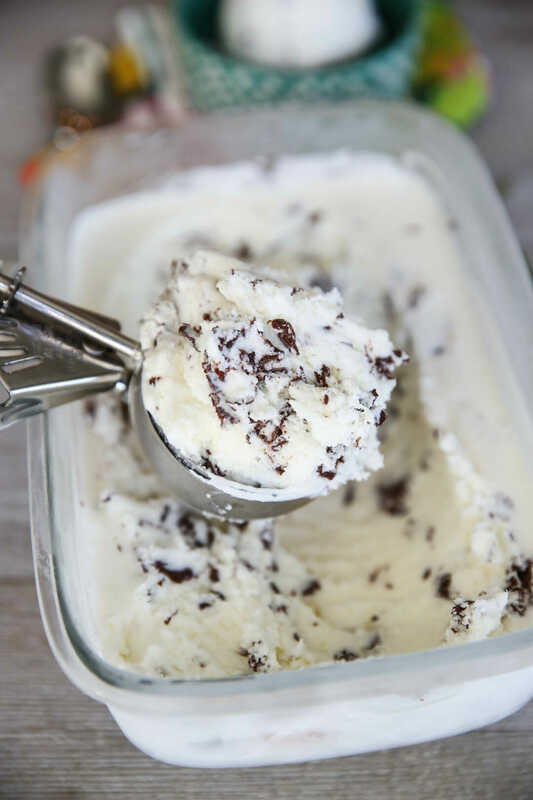 I find it works better to spoon a little finished ice cream into your freezer container, then drizzle some chocolate, then spoon more, then drizzle more, etc. Just kind of mix it up a bit so the chocolate is broken up into lots of little “chips” and then spread it out smooth and pop that container in the freezer. Also- this is not sponsored at all, but I found the PERFECT ice cream containers. 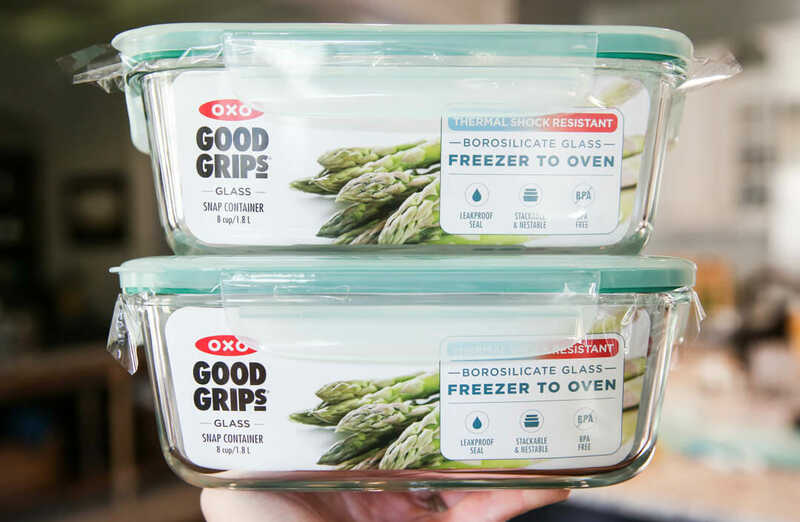 I love Oxo products, and these containers are made of borosilicate glass that can go directly from freezer to oven. Not that you would need to put your ice cream in the oven, but ya know. They are the perfect size for batches of homemade stuff and they’re made to go in the freezer and the lids stay on nice and tight and keep everything fresh. Oh, and they stack! I bought 4 and made 4 flavors recently and they were perfect. You can find them, here! After your ice cream firms up in the freezer you can scoop up. You’ll get fresh, clean mint flavor, and little ribbons and bits of smooth chocolate. I love a good mint-chocolate ice cream and this is perfection! Try it out and tell me what you think! 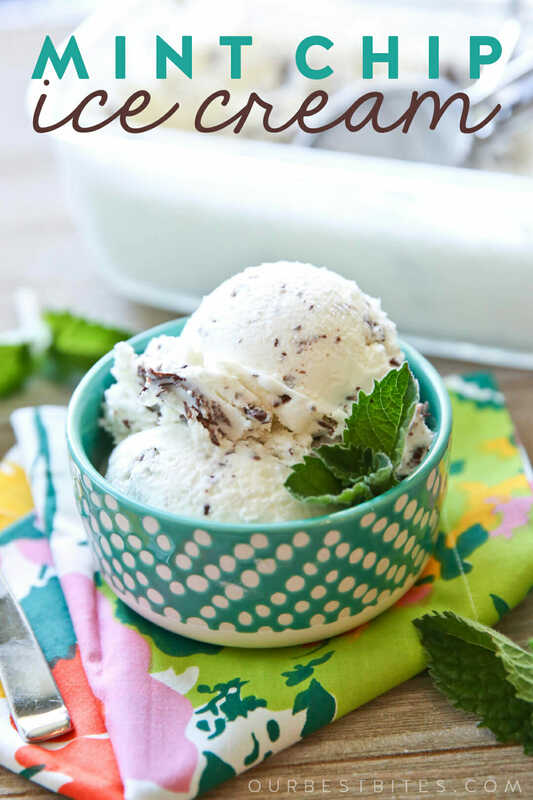 A simple and delicious homemade ice cream with clean mint flavor and soft chocolate bits throughout. 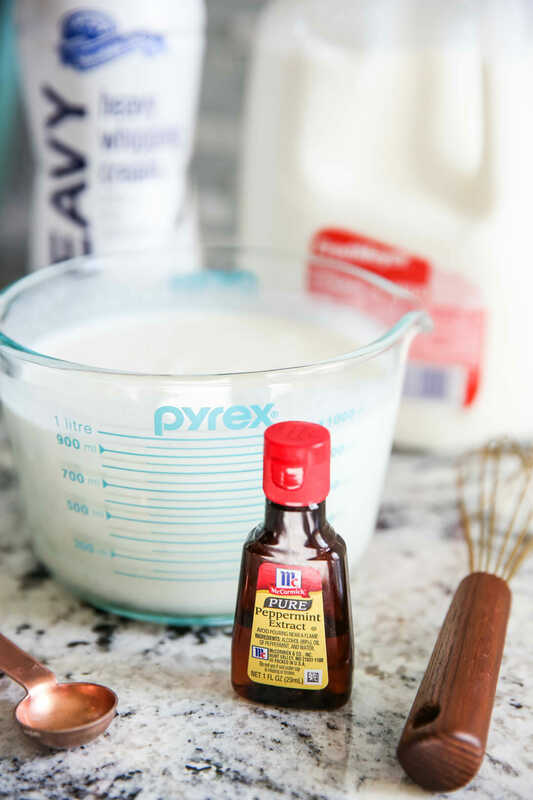 Whisk cream, milk, sugar, vanilla and 1 tablespoon peppermint extract until sugar is dissolved. Churn in ice cream maker according to manufacturer instructions. When ice cream is half-way finished churning, prepare chocolate. Place chocolate and coconut oil in a microwave-safe bowl and heat in 30 second intervals until melted and smooth. Add in 1/4 teaspoon extract. Let cool to just warm. When ice cream is done, transfer to freezer-safe container, drizzling the chocolate mixture throughout. Mix and stir a little so chocolate gets distributed. This looks amazing! And my kids and I were totally wanting to make mint chip ice cream this week too! This totally came at just the right time! Thank you so much for posting this! We got my hubby an ice cream maker for Father’s Day and have really been struggling to find good recipes, nothing has turned out quite right. The last mint ice cream we made tasted like toothpaste. In case you were wondering, frozen toothpaste is nasty. I love that you have tips that make it easy to personalize your recipes, this will be great! Have you tried essential oils for this ice cream? Just wondering how peppermint EO would do here????? Totally trying your recipe btw! It looks amazing! No, you’d just have to do it to taste! Do you add the last 1/4 teaspoon of peppermint extract after you stir melted chocolate and coconut oil? 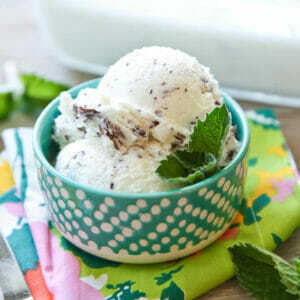 I love mint chocolate ice cream and can’t wait to try this! Sorry, yes! I’ll make that more clear! Yum! Love mint chocolate chip ice cream and that’s exactly how I do the chocolate too. 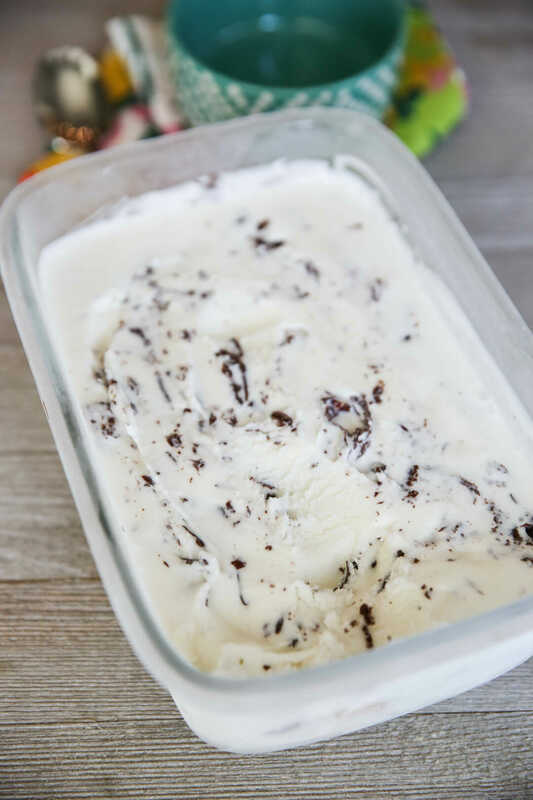 Years ago I found your fresh mint chocolate chip ice cream recipe and fell in love. Definitely doesn’t taste like weeds to me haha. Thanks for another great recipe! Haha, good! If done right with fresh mint, it can certainly be delicious! This looks super easy! Does it stay easily scoopable after it hardens like the blueberry cheesecake recipe? I love that one! No, this one will freeze a little more firm because it’s not custard based. That cooked egg mixture in the blueberry cheesecake one keeps it a little softer!